Tyres are a bit like haircuts if you think about it. They’re the part of the bike that many of us spend the most time fussing and faffing with, and we’re rarely completely happy with how they work. Either they’re too fragile, or too draggy, or not grippy enough or too heavy. Every tyre is a compromise of course – and the main concern for me in recent years has been finding a tyre that won’t give way when it’s slammed into rocks at speed. Especially the rear. Those unusual diagonally positioned knobs seem to help the tyre roll quickly. I thought I was there with Maxxis’ Exo casing tyres like the Minion DHF and Ardent. But then when I started riding them too fast to really pick my line accurately I was holing them a little too regularly for comfort. Chatting about this problem with my pal Ian, he recommended I try Schwalbe’s Super Gravity carcass tyres – and the Hans Dampf in particular as a rear. The tyre has a protective “snakeskin” layer which covers the entire carcass as well as extra layers of rubber on the sidewalls. Knowing that he’d done three weeks in the Alps and raced the Mega at a good speed on them gave me the confidence to take the plunge. I’d been a bit wary as I remembered his complaints when he’d originally fit his, but while I did work up a sweat fitting it, I didn’t find the tyre unmanageably tight on my Crossmax SX rim. The payback for the slight struggle in getting it on was that it was ludicrously easy to inflate even without sealant – though I did squirt a bit in through the valve hole obviously. The Hans (we were on first-name terms by now) hadn’t really looked like my “sort” of tyre, but I have to say I rate it very highly. It rolls fast, has good braking grip and holds onto off camber sections of trail (despite looking like it might not). Riding it on an Orange Patriot with 180mm travel both ends, I mainly used it for local push-up DH tracks initially – where it did a sterling job. However it got a much tougher test when the bike developed a mystery transmission problem on an uplift day at Antur Stiniog, North Wales’ premier destroyer of wheels and other bike parts. Swapping over wheels in an attempt to cure a skipping chain, I did around two-thirds of the day’s runs on the HD – with a double-ply DH tyre on the front. It’s a testament to the tyre that it wasn’t until the final run of the day that one of the former quarry’s many, many spiky rocks finally managed to pierce it. And it sealed straight away, just needing a quick pump-up to operating pressure again. Very impressed with the durability, despite reading some negative comments online. I’ve since started taking the bike on more “enduro” kind of rides, just because I’ve been enjoying riding it so much – and the tyre really doesn’t feel much different to my usual Maxxis when pedalling uphill. 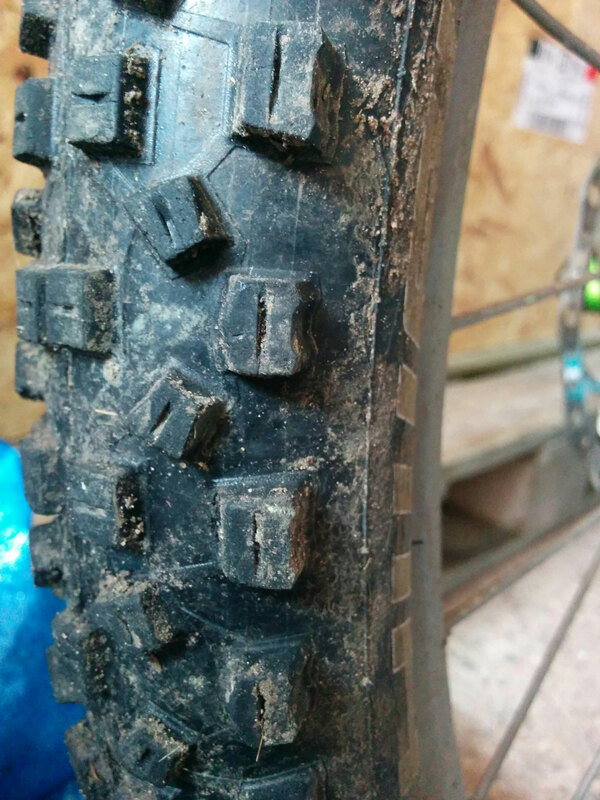 It would make a terrific enduro tyre and I’m sure a lot of racers must love the extra insurance against a wasted race run – but without much of a weight penalty. Speaking of weight, the 26in tyre is under a kilogram – so only 150g-ish heavier than a Maxxis Exo offering – as opposed to 1.3kg or more for a full-on DH tyre (and possibly another 500g for a DH tube). 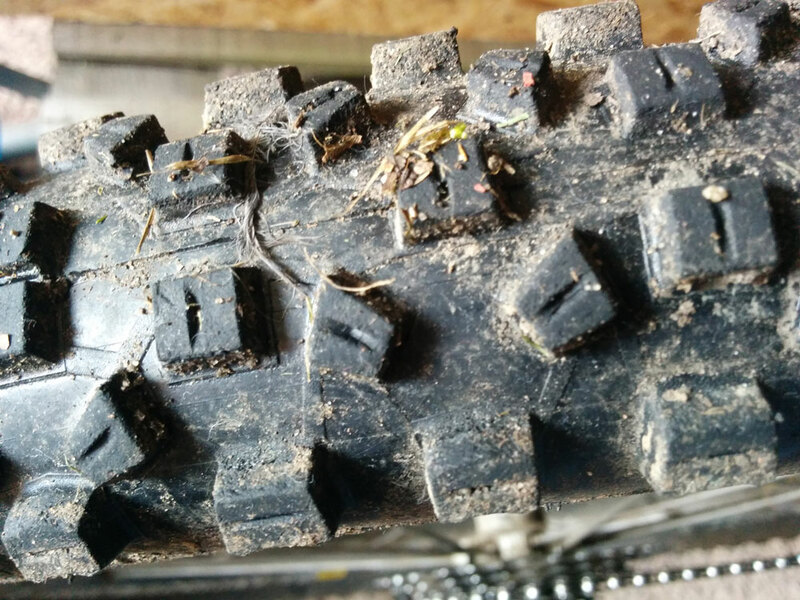 In addition to gripping well and shrugging off rocks, the tyre’s also proved surprisingly durable – showing very few signs of wear after more than six months of semi-regular riding. I’m totally sold on the Super Gravity technology and when I run out of 26in front tyres I’ll probably splash out on a Magic Mary to keep sturdy old Hans company on the Patriot. I might even invest in a 29er Hans for the rear of my trail bike – so I can really cut loose on those long and rocky Lake District descents.